Making phone calls, checking emails and browsing the web are some of the more useful features of Apple’s range of iOS powered gadgets, but the introduction of iMessage meant that even iPod touch and iPad owners can send and receive messages to users who are running iOS 5 and above. It’s always a great feeling when we start to compose a message and wait for the little Send indicator to turn blue, which indicates that it will be sent through the iMessage protocol rather than a standard text message. Obviously, iPod touch and iPad users can only interact with other iMesssage users through the native Messages app due to networking limitations, but what happens if the service is regularly used from the same device for personal and business use? Thankfully, there is a little setting tucked away in iOS which lets users prohibit iMessage from invoking alerts/notifications on the device if a message is received from an unknown number or email address. Follow the simple steps below to ensure that your latest game of Sonic Dash or Fruit Ninja isn’t interrupted by an incoming message from someone you don’t know. Step 1: Open up the native Settings app on the iOS device in question. 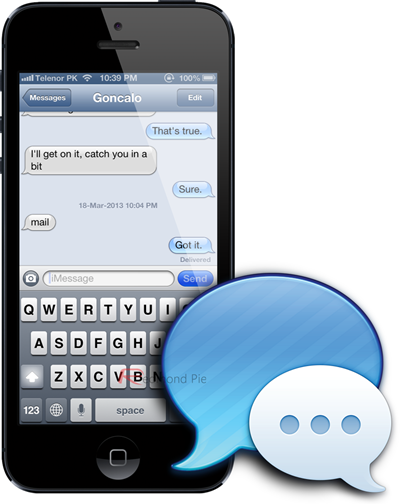 iMessage functions over a Wi-Fi or cellular data network, so the device could be an iPhone, iPod touch or an iPad. Step 2: Select the Notifications entry in the second group of available options in the list of settings. Step 3: Locate the Messages app from the list of apps installed on the device. If the current setup allows the Messages app to post notifications to Notification Center on the device, then it can be found under the ‘In Notification Center List‘. Alternatively, it will be towards the bottom of the list. NOTE: For this process to have any effect, the Messages app is required to have at least one type of notification alert enabled, such as a banner or standard alert. Step 4: Scroll down through the available Messages preferences until you get to the ‘Show iMessage Alerts From:‘ section. Make sure that the My Contacts Only option is ticked. Step 5: The simple but effective process is complete. Only incoming iMessages from saved Contacts will be shown through notifications.